Ever find yourself wondering what that musty smell is in your house? You’ve aired your home by opening the windows and doors in attempt to get some “fresh air” in, but something is not masking up that odour. 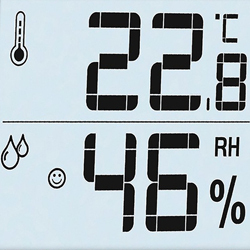 Your home may be prone to high relative humidity; this is the most common measure of humidity, measuring how much water vapour there is in the air compared to how much there can be at that specific temperature. The Beurer HM16 Thermo Hygrometer is a convenient piece of equipment that measures both the temperature and the humidity; it even indicates with a smiley display at the humidity levels in your home. If levels are too high and ignored you may experience more mould and mildew, an increase in dust mites, peeling or blistering wall paper and musty odours. This can be dangerous and needs to be addressed. Mold and mildew are highly toxic and can lead to many health conditions including depression. Humidity is found in every home, some more than others. Humidity is simply water vapour that has either evaporated or condensed onto the windows or hidden elsewhere. An average family can produce around 10 liters of moisture daily just through doing household chores like cooking, cleaning, laundry – the list is endless! Just like those pots are in the sink! So when you’re doing your laundry and you crank the heating up a notch to get your favourite pair of trousers to dry, the “invisible” water vapour condenses into the warm air and then makes contact with either the windows or other cooler surfaces to chill the moisture. The visible areas that you will find condensation are on the windows, door hinges, water pipes and locks. However these aren’t the dangerous areas; some houses will get hidden condensation that can be found in window sills, walls and ceilings which can then lead to mould and begin to peel away the wallpaper and cause damage to the wood frame of the house. You can place your thermo hygrometer wherever you desire; you can hang it up on the wall or use its fold out stand to place on the kitchen work top. The clever little device measures the humidity and the temperature in your home and indicates what level your home is and whether it’s in the ideal level. The optimal levels of your home should be 20-25˚C (68-77˚F) with a humidity of 30-60%; this is clearly displayed on the monitor and if you are in the ideal level you will be shown a on your monitor. Lowering the humidity isn’t as complex as it seems; simple solutions such as cracking the windows open in the kitchen and bathroom will help, this will help to dry the air out especially in the bathroom. When cooking, use the exhaust fan to capture the steam from your boiling pasta or place a lid over the pasta! Enjoy shorter, colder showers (this doesn’t mean freezing cold showers!) and always ensure that the fan is on to dry the air. Use these quick fix resolutions and place your thermos hygrometer in your bathroom or kitchen and watch the levels drop! Don’t ignore the humidity in your home; take action now with the Beurer HM16 Thermo Hygrometer.